could have been a daughter of the Dalton family. They are in semi-chronological order. 1852-1859 birth good The first six children of James & Adeline Dalton were born in Jackson County, Missouri 1. For Bea Elizabeth to be a member of this family she would have to be born in Missouri, but she was born in Texas. circa 1855 correspondence good James & Adeline Dalton had twins – Louis Kossuth and Lelia. Both died young 2. Bea Elizabeth cannot be Lelia Dalton. 1860 census Census not found (Littleton Dalton said his family left Missouri, stopped briefly in Denver, CO in 1860 and moved on to Kansas) 3. 1870 census 4 Census excellent Dalton family, Cass cty, MO – no record of anyone named Bea or Elizabeth (or Lelia, who was dead). 1880 census 5 Census excellent Dalton family, Bates cty, MO – no record of Bea or Elizabeth or Lelia. 1892 Probate Record court record excellent Death affidavit & probate for Robert & Gratton Dalton 6 – lists all heirs – no record of Bea or Elizabeth or Phillips relative and no mention of Lelia. 1892 reports newspaper good Partial list of surviving Dalton family members 7 8 – no mention of Bea or Elizabeth or Phillips or Lelia. June 1894 interview newspaper good Jane Blivens Dalton gives reporter a list of husband Bill Dalton's siblings 9 – no mention of Bea or Elizabeth or Phillips – though she was alive and lived less than 10 miles away. 1900 census 10 Census excellent Dalton family, Cimarron, Kingfisher cty, Oklahoma Territory – no Bea, Elizabeth or Phillips. 1918 book "Beyond the Law" good Emmett Dalton's list of children 11 – no mention of Bea or Elizabeth or Phillips. 1925 obituaries newspaper good Adeline Dalton 12 – no mention of Bea or Elizabeth or Phillips. 1937 obituaries newspaper good Emmett Dalton 13 – no mention of Bea or Elizabeth or Phillips. 1964 obituaries newspaper good Leona Dalton 14 – no mention of Bea or Elizabeth or Phillips. 1987 obituaries obituary forgery Billy Murl Phillips provides researchers altered obituaries of Dalton family members "proving" his grandmother was their daughter or sibling 15 16 17. 1987 headstones headstones alteration Dalton family headstones "replaced" by Billy Murl Phillips 18 – Bea Elizabeth Phillips engraved as a child or sibling. Abendroth, Myrtle to Philip Steele; letter, (unknown date), (Dalton descendant and family historian. ); Myrtle Abendroth, Dalton historian. Dalton, Bob & Grat; Coffeyville, Kansas Probate Court Records; filed: October 15, 1892; final settlement: May 2, 1895; Judge Daniel Cline; Kansas Probate Court Records. "Career of the Daltons"; The Wichita Daily Eagle (Wichita, Kansas); October 6, 1892, page 1, col. 7, Career of the Daltons. "The Bandits Family", Topeka Daily Capital, Topeka, Kansas, October 8, 1894. "Bill Dalton Dead", The Ardmore Daily Ardmoreite, Ardmore, Chickasaw Nation, Saturday, June 9, 1894, Ardmore Daily Ardmoreite. MyKindred.com Genealogy & Family Histories, "Newspaper accounts of Adeline Dalton's death" Newspaper accounts of Adeline Dalton's death. MyKindred.com Genealogy & Family Histories, "Newspaper accounts of Emmett Dalton's death" Newspaper accounts of Emmett Dalton's death. Dalton, Leona : obituary, Kingfisher Free Press (Kingfisher, Oklahoma), Monday, April 20, 1964, Leona Dalton Dies; Funeral Scheduled Tuesday Morning. "Mrs. Dalton Talks", The Ardmore Daily Ardmoreite – rev. by Bill Phillips, Ardmore, Chickasaw Nation, Saturday, June 9, 1894, Altered newspaper article. MyKindred.com Genealogy & Family Histories, "The altered obituary of Adeline Dalton" The altered obituary of Adeline Dalton. MyKindred.com Genealogy & Family Histories, "The fraudulent Leona Dalton Obituary" The fraudulent Leona Dalton Obituary. Note: The Dalton family was never in Texas. 1860 census Census excellent Bea Elizabeth, by any last name – Not Found. 1870 census Census excellent Bea Elizabeth, by any last name – Not Found. 1880 census Census excellent Bea Elizabeth, by any last name – Not Found. 1894 death Phllips family unknown Buried at Tussy Cemetery 1; no burial or funeral home records 2 3, but cemetery surveys list their graves. 1900 census 4 Census excellent Childrens' mother's birth place TEXAS. 1910 census 5 Census excellent Childrens' mother's birth place TEXAS. 1920 census 6 Census excellent Childrens' mother's birth place TEXAS. 1930 census 7 8 Census excellent Childrens' mother's birth place TEXAS. 1931 death certificate Oklahoma govt. record good Her son Lee Phillips' death certificate 9 – mother's maiden name given as DALTON and birth place TEXAS. 1938 social security application U.S. govt. record excellent Her first child Jno Phillips 10 gives his birth as 1882 in Kerrville, Texas and his mother's maiden name as Bea HARRIS. 1939 social security application U.S. govt. record excellent Her youngest son Jack Phillips 11 incorrectly gives his birth as 1895 in Kerrville, Texas and his mother's maiden name as Edna DAWLTON. 1963 death certificate California govt. record good Her oldest child John Phillips' death certificate 12 – mother's maiden name given as HARRISON. 1974 death records Oklahoma govt. record good Her youngest son's death certificate 13 and funeral home record 14 – mother's maiden name given as HARRISON. 1987 death certificate Oklahoma govt. record false Delayed filing death certificate 15 obtained by grandson Billy Murl Phillips – all information proven false. 1987 headstones headstones false Alternate headstones for Tom & Bea Phillips placed by grandson Billy Murl Phillips at Elmore City Cemetery 16 with false engraving listing her parents as James & Adeline Dalton. They are not buried at Elmore City, they are buried in the Tussy Cemetery. MyKindred.com Genealogy & Family Histories, "History of the Yeary Funeral Home" History of the Yeary Funeral Home. Phillips, Alford Lee, Death Certificate, July 16, 1931; Oklahoma State Board of Health, Bureau of Vital Statistics, Oklahoma City, Oklahoma; Alford Lee Phillips' death certificate. John William Phillips, 526-18-7040, "U.S. Social Security Application" (November 25, 1938), Social Security Administration, John Phillips' Social Security Application. Jack Phillips, 443-12-1356, "U.S. Social Security Application" (August 26, 1939), Social Security Administration, Jack Phillips' Social Security Application. Phillips, John William, Death Certificate, March 5, 1963; California Department of Public Health, Vital Records, Sacramento, California, John Phillips'death certificate. Phillips, Jesse Jackson "Jack", Death Certificate, January 8, 1974; Oklahoma State Board of Health, Bureau of Vital Statistics, Oklahoma City, Oklahoma; Jack Phillips' death certificate. Phillips, Bea Elizabeth, Delayed Filing Death Certificate, died: December 28, 1894, filed: April 2, 1987; Oklahoma State Board of Health, Bureau of Vital Statistics, Oklahoma City, Oklahoma; Bea Elizabeth Phillips' Fraudulent Death Certificate. 1900 census 11 Census excellent Phillips family, Chickasaw Nation, Indian Territory – childrens' mother's birth place TEXAS. 1910 census 12 Census excellent Phillips family, childrens' mother's birth place TEXAS. 1920 census 16 Census excellent Phillips family, childrens' mother's birth place TEXAS. 1930 census 17 18 Census excellent Phillips family, childrens' mother's birth place TEXAS. 1930 19 Burial Record excellent Tom Phillips died one month after the census was taken and was buried in Tussy Cemetery..
"Texas, County Tax Rolls, 1846-1910," index and images, FamilySearch, Kerr county > 1881 > image 30-31 of 68; State Archives, Austin. "Texas, County Tax Rolls, 1846-1910," index and images, FamilySearch, Kerr county > 1882 > image 27-28 of 66; State Archives, Austin. "Texas, County Tax Rolls, 1846-1910," index and images, FamilySearch, Kerr county > 1883 > image 31-32 of 78; State Archives, Austin. "Texas, County Tax Rolls, 1846-1910," index and images, FamilySearch, Kerr county > 1885 > image 39-40 of 83; State Archives, Austin. Phillips, Lee (Alford), United States, Selective Service System. 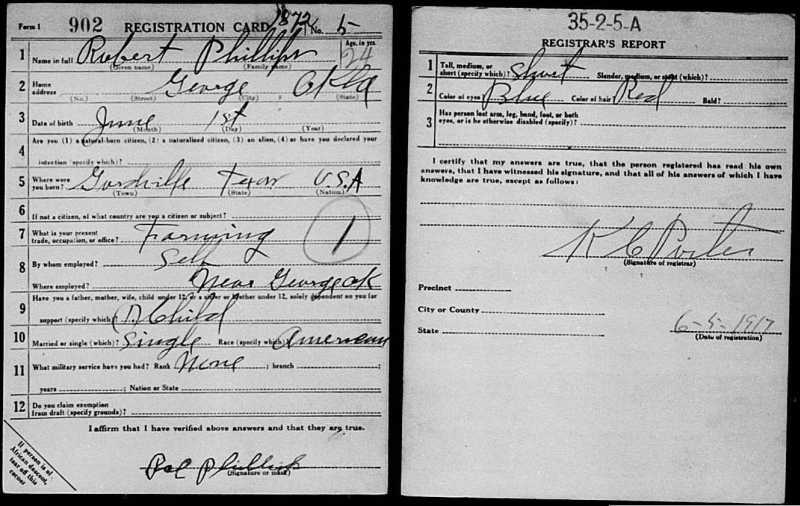 World War I Draft Registration Cards, June 15, 1917; Washington, D.C.: National Archives and Records Administration; Lee Phillips' WW-I draft registration. Phillips, Robert, United States, Selective Service System. 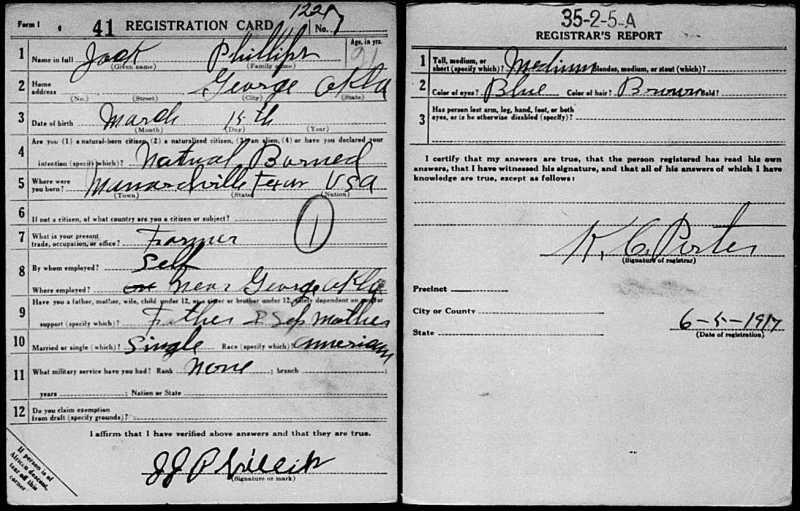 World War I Draft Registration Cards, June 15, 1917; Washington, D.C.: National Archives and Records Administration; Robert Phillips' WW-I draft registration. Phillips, Jack, United States, Selective Service System. 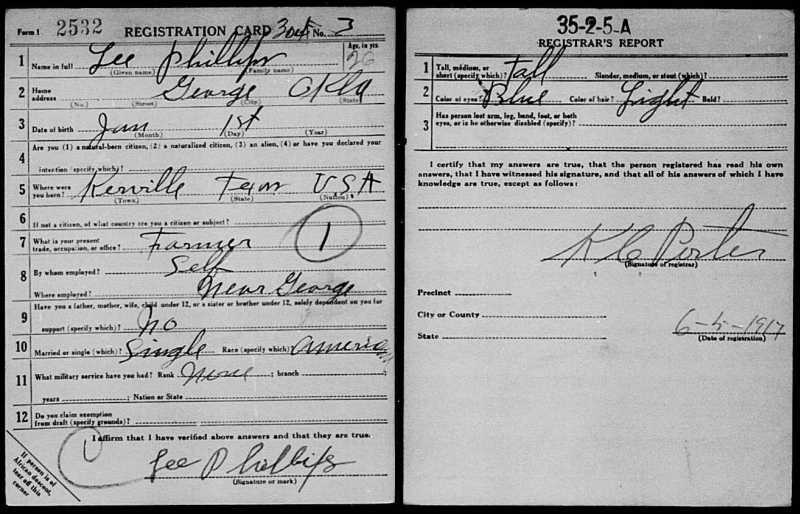 World War I Draft Registration Cards, June 15, 1917; Washington, D.C.: National Archives and Records Administration; Jack Phillips' WW-I draft registration. impossible because she was born in Texas 1.
she would have been 13, no other family member left, why would she? No evidence – appears to be contrived to explain childrens' social security applications & death certificates which give her maiden name as HARRIS or HARRISON. Two versions of Bible page presented. Access to original denied. Ball point entries weren't possible until decades after her death..
oral history unknown poor - unsubstantiated Claim: "Outlaws" – allegedly the Daltons & associates – visited the family barn at night. oral history unknown false Claim: Phillips descendants named for Dalton family members. No child, grandchild or great grandchild of Tom & Bea Elizabeth Phillips has a Dalton name 4.
oral history unknown false Claim: A Phillips was a pall bearer at Simon Dalton's funeral 5. The pall bearer was a friend, not a relative..
oral history unknown false Claim: A Phillips relative's name is engraved on Nannie Dalton Clute's gravestone 6. The monument maker engraved his name on the bottom-reverse of the stone. He was not related to either the Daltons or this Phillips family. No evidence exists prior to this of her ever using the name Lelia. 1987 Headstones headstones false Proven alteration of Dalton and Phillips family tombstones by Bill Phillips to add Elizabeth's name as child of Daltons 10 11 12 13 14 15 16 17 18 19 20. 1992 obituary newspaper good Norma Phillips Gordon 21 – no mention of a Dalton relationship. 1992 obituary newspaper good Jay Phillips 22 – no mention of a Dalton relationship. 1993 obituary newspaper good Annie Phillips 23 – no mention of a Dalton relationship. 1998 obituary newspaper good Aford Lee Phillips 24 – published in his hometown newspaper – no mention of a Dalton relationship. 1998 obituary newspaper questionable Aford Lee Phillips 25 – published one month later in the newspaper of his nephew Bill Phillips' hometown of Wynnewood – Dalton genealogy added. 2004 obituary newsletter questionable Loyce Phillips 26 – submitted to Dalton Genealogical Society by his brother Bill Phillips – Dalton genealogy inserted. 2006 obituary newspaper good Billy Phillips' obituary 27 – no mention of a Dalton relationship. 2008 obituary newspaper good Marlene Phillips' obituary 28 – no mention of a Dalton relationship. 2013 obituary newspaper good Kenneth Phillips' obituary 29 – no mention of a Dalton relationship. MyKindred.com Genealogy & Family Histories; Finding Bea Elizabeth Phillips, Researching Bea Elizabeth Phillips. MyKindred.com, The Dalton Names Hoax, The Dalton Names Hoax. MyKindred.com Genealogy & Family Histories; Phillips References, Phillips References. Phillips, Billy Murl, Bill "Dalton" Phillips' Falsified Genealogy, Bill "Dalton" Phillips' Falsified Genealogy. Dalton, Adeline Lee Younger : burial; Kingfisher Cemetery, Kingfisher, Oklahoma; Oklahoma Cemeteries Website. Phillips, Bill; letter, December 4, 1987, Bill Phillips letter of Dec. 4, 1987. Phillips, Bill; letter, February 2, 1988, Bill Phillips letter of Feb 2, 1988. Phillips, Bill; letter, February 20, 1988, Bill Phillips letter of Feb. 20, 1988. Montgomery, T.I. to Bill Phillips; letter, March 30, 1988, T.I. Montgomery to Bill Phillips. Smith, Shirley to Bill Phillips; letter, May 6, 1988, Shirley Smith to Bill Phillips. Gordon, Norma Jean Phillips : obituary; unknown newspaper; Norma Jean Phillips Gordon. Phillips, Jay : obituary; The Davis News (Davis, Oklahoma), December 24, 1992; Jay Phillips. Phillips, Annie : obituary; unknown newspaper – findagrave.com; Annie Phillips. Phillips, Alford Lee : obituary, unknown newspaper, October 30, 1998, Alford Phillips. Phillips, Alford Lee : obituary, The Wynnewood Gazette (Wynnewood, Oklahoma), Thursday, Dec. 3, 1998, Alford Phillips' fraudulent obituary. Phillips, Loyce : obituary; Dalton Genealogical Society; Loyce Phillips, – Daltons in History; Volume 7 No 12, December 2004. Phillips, Billy : obituary; unknown newspaper – findagrave.com; Billy Phillips, – findagrave.com. Phillips, Marlene : obituary; Pauls Valley Democrat (Pauls Valley, Oklahoma), Wednesday, February 20, 2008; Marlene Phillips. Phillips, Kenneth Keith : obituary; Pauls Valley Democrat (Pauls Valley, Oklahoma), Wednesday, April 3, 2013; Kenneth Keith Phillips.